On March 2017 NATO members decided that the next Meeting of the North Atlantic Council at the level of Heads of State and/or Government should take place in Brussels on May 25, 2017. The alliance’s members in the meeting inaugurated the new NATO headquarters in Brussels. This new, modern complex of offices was built in front of the old headquarters along boulevard Léopold III in the north-eastern part of the Belgian capital. Beside the inauguration of the new headquarters, NATO Secretary General Jens Stoltenberg pointed out during a press conference ahead of the meeting that the two main subjects that would be debated during the summit will be the strengthening of NATO commitment against terrorism and the budgetary sharing of the alliance’s member states. Furthermore, Stoltenberg stated that the creation of a new intelligence cell within NATO will be debated. Furthermore, after his initial statement, NATO Secretary General has been questioned about several subjects like counter-terrorism, Manchester attack, NATO joining the coalition against ISIS, and the relations between the North Atlantic alliance and Russia. 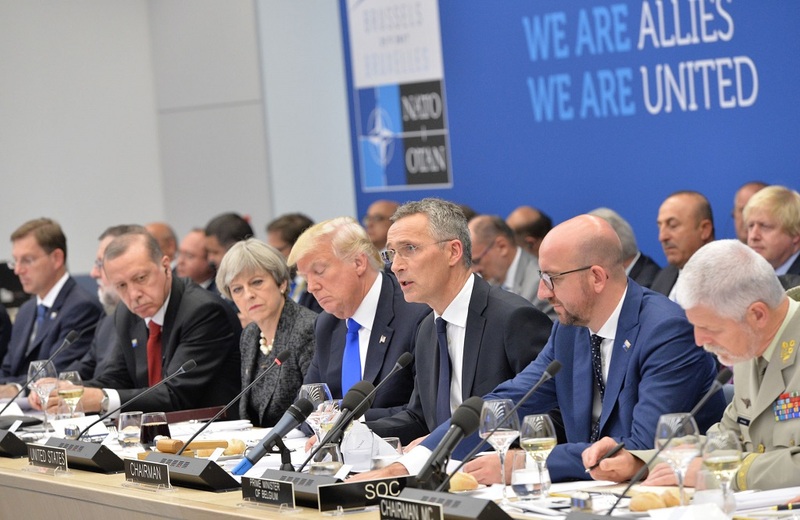 Secretary General’s replies were quite straight: NATO commitment against terrorism is solid and joining the Coalition against ISIS is a strong political message of unity of the alliance; Stoltenberg added that Russia is always on NATO’s agenda. US President Donald Trump was the protagonist of the Meeting. The two main subjects discussed in the summit were dictated by the American administration and especially the second discussion theme was central in Trump’s presidential campaign. It is quite clear the subjects discussed in the meeting have a common, political end, that is, on the one hand to relieve the US from the financial burden of the struggle against ISIS sharing this fight with the whole of NATO alliance; on the other hand, a higher military spending by NATO members can led to a shift of US main military efforts towards Asia. Trump’s participation in the NATO meeting has been the occasion for the US President to meet several Heads of State, among them the new French President Emmanuel Macron, and the EU authorities, including Donald Tusk and Jean-Claude Juncker. After the dedication of the 9/11 and Article 5 memorial, in which the NATO Secretary General stressed the importance of the bond of the alliance’s member states, Jens Stoltenberg opened the meeting summarizing in a short assessment the most important challenges for the alliance, i.e., ‘Terrorism and instability. A more assertive Russia. The proliferation of nuclear weapons. And the growing threat of cyber-attacks’. During the press conference after the meeting, Stoltenberg made a short summary about the decisions took in the meeting. Regarding the first point of debate, i.e., the fight against terrorism, the Secretary General stated that there are different levels of cooperation for NATO members, from national policies up to alliance’s collective decisions. Nonetheless, it was decided that NATO will continue to train troops in Afghanistan and Iraq and that NATO will take part to the coalition against ISIS, although it will not engage in combats, but will gather and share more information through an increase of flying hours of AWACS aircrafts. Since NATO is fully engaged in the fight against terrorism, Stoltenberg announced that a senior NATO officer will be nominated as coordinator of anti-terrorism activities within the alliance. Regarding the second main theme debated in the meeting, i.e., a fairer burden-sharing across the alliance, the Secretary General said that member states are already investing higher GDP’s percentages for the defence, but more must be done. In this sense, member states must write a roadmap to clarify how they will reach the 2% GDP for defence expenditures, how they will invest in better military capabilities needed by the alliance and, finally, how they intend to contribute to NATO missions, operations and other engagements. Finally, Stoltenberg told that NATO relations with Russia has been debated. The Secretary General affirmed that the alliance will continue its dual-track approach, i.e., strengthening the military means and keeping a meaningful dialogue with the Russians. It has been made clear that NATO does not want to provoke a conflict and want to work for keeping peace together with Russia. The questions from the journalists during the press conference focused mainly on Trump’s attitude towards NATO and the relation NATO-Russia. Stoltenberg was clear assessing that the American commitment to the alliance is strong and US President Trump showed it well not only with the discourse of dedication to the 9/11 and Article 5 memorial, but also confirming that he will rise the budget of American troops in Europe by 40%. Regarding Russia, Stoltenberg reaffirmed the defensive nature of the alliance and the will to keep peace and a friendly relation with Moscow. Nonetheless, the Secretary General was quite blunt about the assertiveness of Russian foreign policy in eastern Europe when he affirmed that ‘Russia is willing not only to invest heavily in defence but to actually use military force to change borders in Europe with its aggressive actions against Ukraine, illegally annexing Crimea and continuing to undermine, to destabilize eastern Ukraine, then of course NATO has to react’.